speedy setup time and great sound, all in one package. 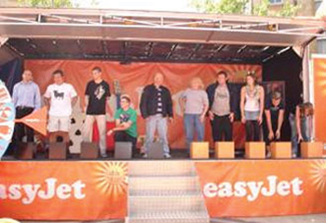 Our Roadshow Mobile Stages are Suitable for Outdoor festivals and Medium sized events where quick set up and de-rig are of paramount importance (approximately one hour setup including full sound system). Our units are custom designed on 7.5 Ton Trucks and can access areas where most trailer stages have difficulty. 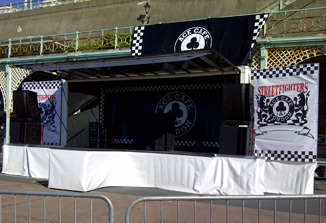 The SS03 Unit has a 7 metre by 5.5 metre fully carpeted stage area. Our stage also includes as standard 6 x Par 56 Lights which are fully programmable. 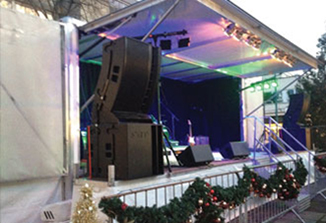 Our standard sound system package with this stage includes a Pro FBT compact line array system with up to four monitor mixes, monitors, desk, microphones etc. and includes a professional sound engineer. Mixing and control is done from a stage-side covered area, so there is no need for unsightly front of house canopys. Other systems & specifications can also be supplied, on request. The SS01 unit has a 7 metre by 3.5 metre fully carpeted stage area, including 4 x 300 watt flood lights. 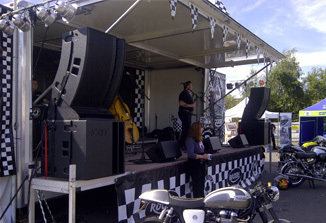 This unit can be hired as stage only or with a sound package.